The TXTextControl.DocumentServer.MailMerge.FieldMerged returns useful information and options to manipulate the merged content in the TXTextControl.DocumentServer.MailMerge.FieldMergedEventArgs . Since version X14 (24.0), the TXTextControl.DocumentServer.MailMerge.FieldMergedEventArgs.TableCell property returns a TXTextControl.TableCell object in case the merge field is positioned inside a table. This can be used to manipulate the table cell based on merged values. The following code creates a new instance of the reporting engine TXTextControl.DocumentServer.MailMerge , attaches the FieldMerged event and calls the TXTextControl.DocumentServer.MailMerge.MergeObjects method to merge a template with the created data object. 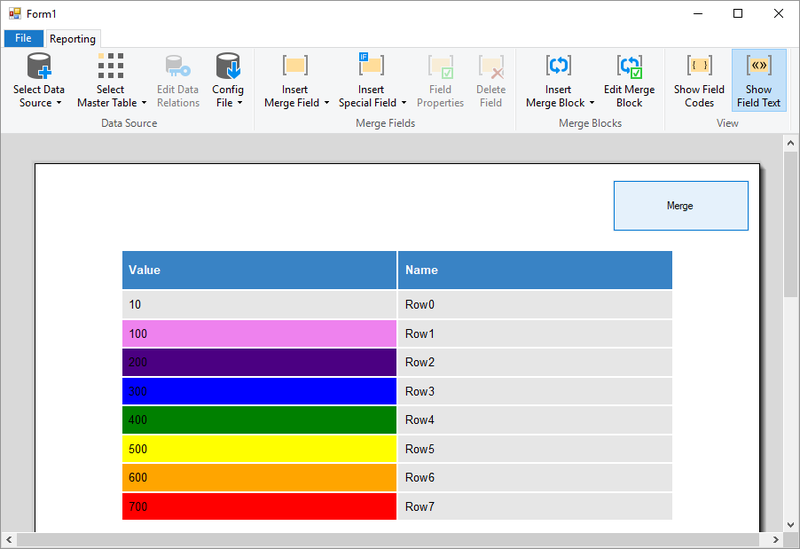 In the FieldMerged event, the field value is parsed and mapped to a color based on the value range. Accordingly, the background color of the outer table cell is highlighted. This is just one of many ideas what to do with the flexible reporting framework MailMerge to customize the merging process.